Trap DJ duo Flosstradamus is celebrating a decade of music all throughout 2016. Flosstradamus started by selling out Red Rocks on 4/20 for their second annual HDYFest. Then they headlined the Main Stage at HARD Summer. Flosstradamus' closing set at Lollapalooza featured an impressive tribute to their hometown of Chicago with guest appearances from Chance The Rapper, Dwyane Wade, Michelle Williams and others. Now Flosstradamus is coming back to Atlanta for another highly energetic show at the historic Tabernacle. 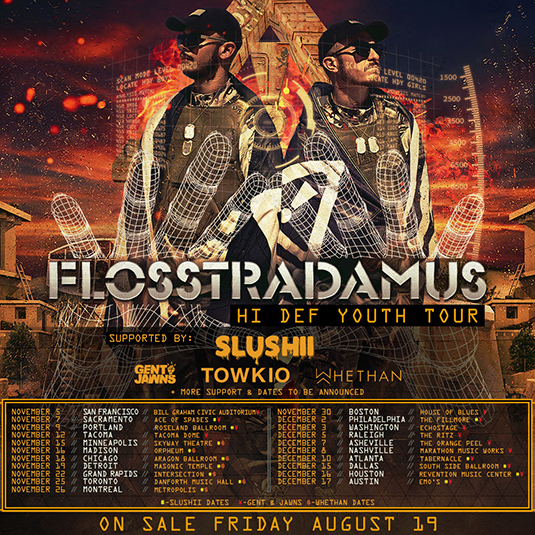 Tickets go on sale Friday for the 10 December Flosstradamus show. Comprised of Josh Young and Curt Cameruci, Flosstradamus have consciously evolved for the past 10 years. Their own signature style of bass reflects their roots in Chicago while also skating upon hip-hop’s boundaries. Visit Flosstradamus.com for more details.